Die Diskussionsrunde mit Lesung am 9. Oktober in der Buchhandlung BiBaBuZe war für Rebecca Lolosoli, der Gründerin des ersten afrikanischen Frauendorfes im Norden Kenias, die erste Station im Rahmen ihrer Vortragsreise im Rheinland auf Einladung einiger Plan-Aktionsgruppen, u. a. Köln, Bonn und Mönchengladbach. Die 40 Gäste waren sehr beeindruckt und nachdenklich gestimmt von Rebecca Lolosolis teils sehr persönlichen Schilderungen ihrer Lebensumstände in Kenia. Die von der Co-Autorin Birgit Virnich ausgewählten Passagen aus dem Buch haben dies mit Nachdruck unterstrichen. Neben den an Rebecca überreichten Spendengeldern (€110), die für die Ausbildung einer Lehrerin in Umoja vorgesehen sind, konnten wir aus dieser Aktion und anderen Spendeneinnahmen zwei Berufsausbildungen für Mädchen in Sambia von jeweils € 46 finanzieren. Wir danken Frau Westermann von der Buchhandlung BiBaBuZe, dass wir den interessanten Abend gestalten durften und möchten darauf hinweisen, dass dort noch „Mama-Mutig“-Bücher und Flyer mit Fakten und Fotos zu Umoja vorrätig sind. Kontakt unter www.bibabuze.de. thank you for a wonderful trip to Germany. Last year I went to Africa House in Munich, I travelled to Stuttgart and Mannheim, where I met young designers, who are setting up new businesses. Hopefully, we will one day be able to cooperate with them and supply the jewellery for their new designs. I was also greatly impressed with the work of „medica mondiale“ and Monika Hauser, who has greatly inspired me. I also visted several womens`s centres and shelters and was impressed by the way they deal with women who have been abused in Germany. 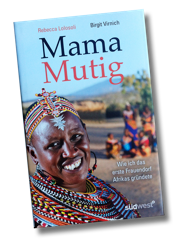 This year I really enjoyed the readings from our book „Mama Mutig“ in Düsseldorf, Mönchengladbach, Bonn, Cologne, Essen, Münster and Werl. Each setting had its own atmosphere that greatly enhanced our events. I found the people very receptive. The audiences took great interest in UMOJA and wanted to find out all they could about how we manage life in our village amidt drought and other hardships, while building up a democratic and respectful life style in UMOJA. Also the school children, whom I met during the day seemed very interested in our daily life and supportive of our school project and the fact, that we want to send a young Samburu woman to Teacher`s Training College in Meru. 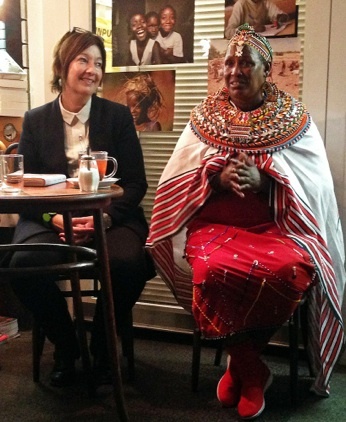 All in all it was a wonderful experience and I return to Kenya inspired by the hospitality and kindness of the people I met in Germany. My special thanks to all the women from the various PLAN groups, to Veronika, Helmut and Ise for investing so much time to organise and look after me, to Johanna Pulheim for inviting me, to Susanne Zimmermann for having me in her church, to the Post women for organising that wonderful „Spendenlauf“. Thank you to the family in Mönchengladbach for their generosity, to Maria Gimbel and Roswitha Virnich-Böhne in Essen, to Susanne Eichler in Münster and to Wolfgang Klesse in Werl. Thank you to the students and teachers for having me at your schools. To Paul for accompanying me and supporting me in Suaheli. I will do everything in my power to establish a network between our students in Kenya and Germany to exchange ideas and experiences in the years to come. This would be most precious to me and I think this will be one of the biggest rewards for me from this trip. Asante sana to all of you. May God bless you.